First guest night of 2014 starts with Nightwatch bringing their “Musical History Tour” show. 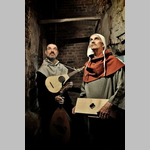 It consists of Andy Casserley and Ian Pittaway playing a plethora of period instruments and singing songs from the 12th to the 17th Century. Why was a well known Christmas song never sung at Christmas? Why was farting so enjoyable in the 17th century? These and other Highbrow and lowbrow questions will be answered on the night.